The COPIS is a manual Megalodon. It is a high quality recreational and technical CCR that boasts all the same features of the Megalodon, but operates manually  adding simplicity and reliability. 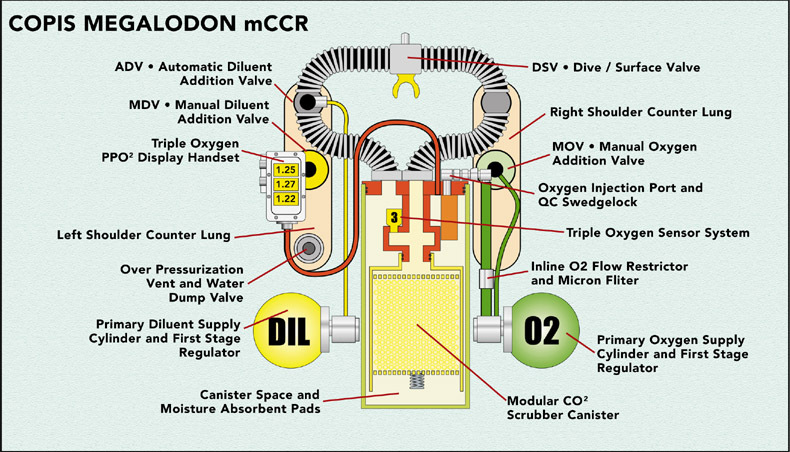 A manual CCR (mCCR) differs from the electronic CCR (eCCR) in that it has no computer or solenoid. 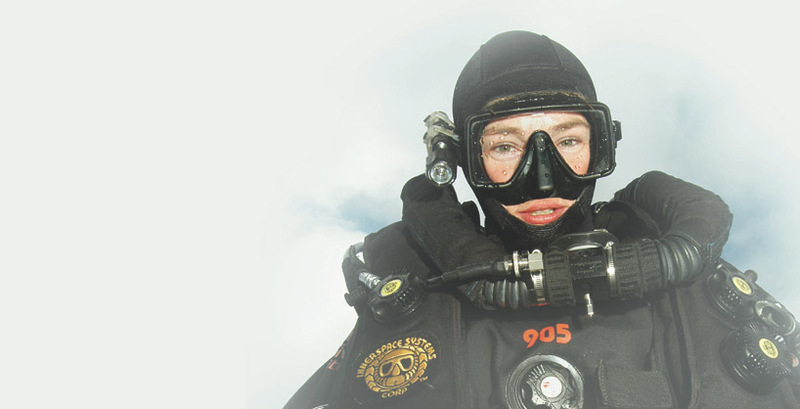 Maintenance of the PO2 is solely the responsibility of the diver. 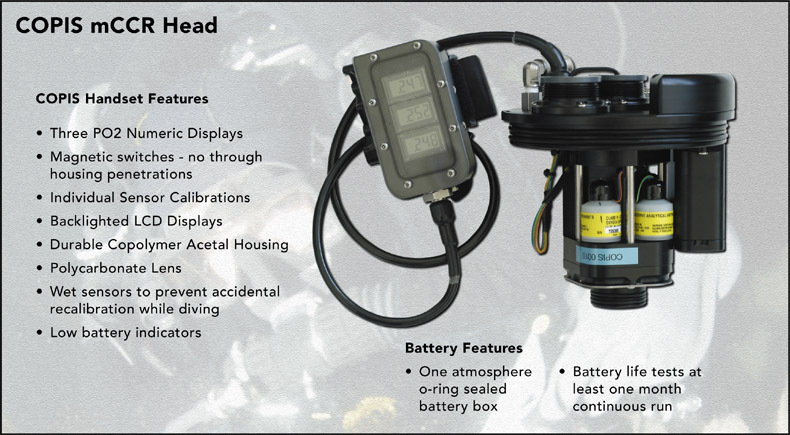 The COPIS has three PO2 sensors and displays to let the diver know what his/her PO2 level is. The diver then responds to the information by adding either oxygen or diluent to keep the PO2 at the desired level. In this system, the computer is the divers brain, and the solenoid is the manual add valve coupled with the constant oxygen flow into the loop. Since the COPIS has a constant flow of oxygen into the loop, the PO2 maintenance by the diver will be easier. When the oxygen flow is keyed correctly for the divers, VO2 usage manual oxygen additions will be minimal. This is not to say the diver does not have to monitor the PO2 every few minutes. The COPIS Meg is essentially the same as the APECS Meg, except that it does not have a setpoint controller nor an oxygen solenoid. The oxygen first stage regulator and inline flow restrictor is designed to allow a setable oxygen flow into the breathing loop. 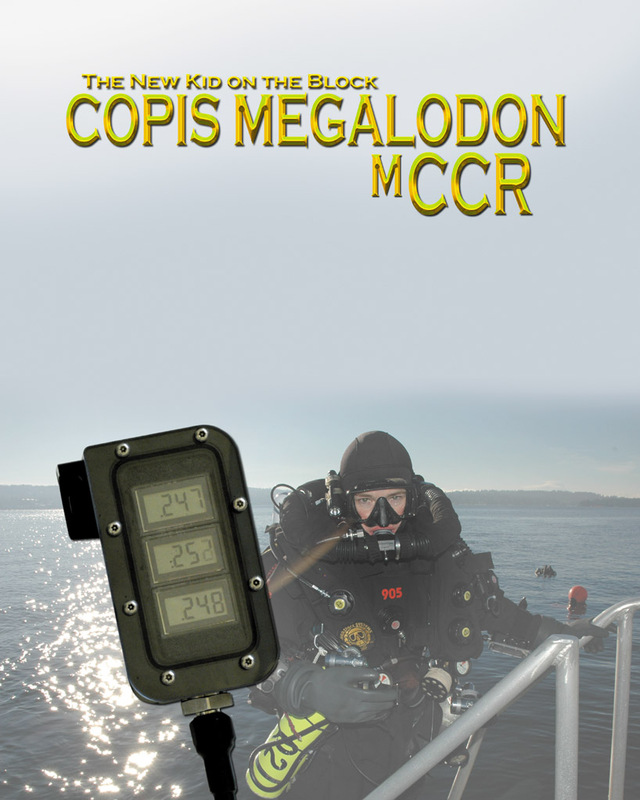 The COPIS is a modular system, allowing the diver to upgrade and change the CCR as needed. If the diver later wants an eCCR, all they need to do is purchase an APECS head. Also, the ability of the COPIS to use virtually any cylinder size allows great flexibility when traveling. The COPIS can be packed in carry-on baggage, assuring it will arrive unharmed. Like the APECS Meg, the COPIS has several scrubber options. The standard scrubber is the 5.5-pound axial scrubber. The diver may choose to upgrade to a radial scrubber. The diver has the same options in scrubber can size as the standard COPIS or mini-COPIS. The COPIS offers great protection from a caustic cocktail. Starting with the OTS CLs, and the completely partitioned T-pieces, followed by the large water trap in the bottom of the scrubber, you could virtually flood the whole system without inhaling caustic cocktail. The OPRV located on the exhale CL at the bottom allows the diver to de-water the system, if necessary. Furthermore, a flooded system would not likely result in expensive repairs. This is due to the triple display being a separate sealed unit. The battery box in the head is also sealed. Other key features of the COPIS include the easily removable head. This allows the diver to take the head assembly to a location where it can be dried without having to lug the whole unit. The OTS CL are easily removable, allowing for proper sanitization and complete drying. The oxygen regulator IP is adjustable, allowing the diver to increase or decrease the constant oxygen flow to suit their VO2 needs. Optionally, the COPIS is available with a HUD. The HUD will act as a secondary display and give the unit total redundancy.